This is the first full moon after the December solstice. In North America, we commonly call this full moon the Old Moon or Moon After Yule. The photograph above is by sky artist, Dan Bush, by the way. Be sure to check out his moon page. Look for tonight’s full moon to rise in the east around sunset today (Wednesday, January 19). Like every full moon, it will climb highest in the sky around midnight and will set in the west tomorrow around sunrise. For general reference, we can say the moon is full all night tonight. Astronomically speaking, though, the moon is full for only an instant. That instant occurs when the moon is most opposite the sun for the month. Today, that happens at 21:21 Universal Time. For the U.S. time zones, that places today’s full moon at 4:21 p.m. Eastern Time, 3:21 p.m. Central Time, 2:21 p.m. Mountain Time and 1:21 p.m. Pacific Time. In the United States, the moon turns full during the afternoon hours today. At this full moon instant, the moon has to be below our horizon, because the sun is shining above it. In other words, the full moon lurks about as far below the horizon as the sun stands above it. However, on the other side of the world – like in Europe, Africa and most of Asia – the full moon occurs during the nighttime hours tonight. For that part of the world, the moon at this full moon instant stands above the horizon while the sun sits beneath it. In the Middle East, the moon turns precisely full at midnight, so the full moon shines high overhead, while the sun lies directly underfoot. 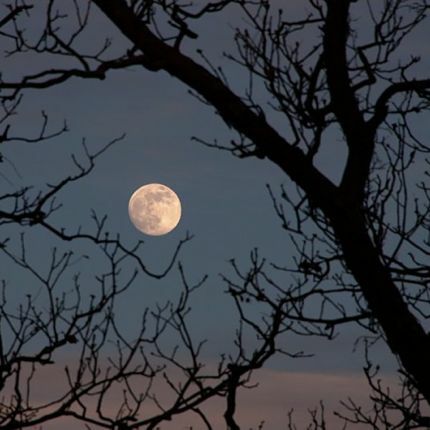 Watch the January full moon tonight, as it beams from dusk until dawn!